Friday Photo: Stephen’s Custom Jacket! 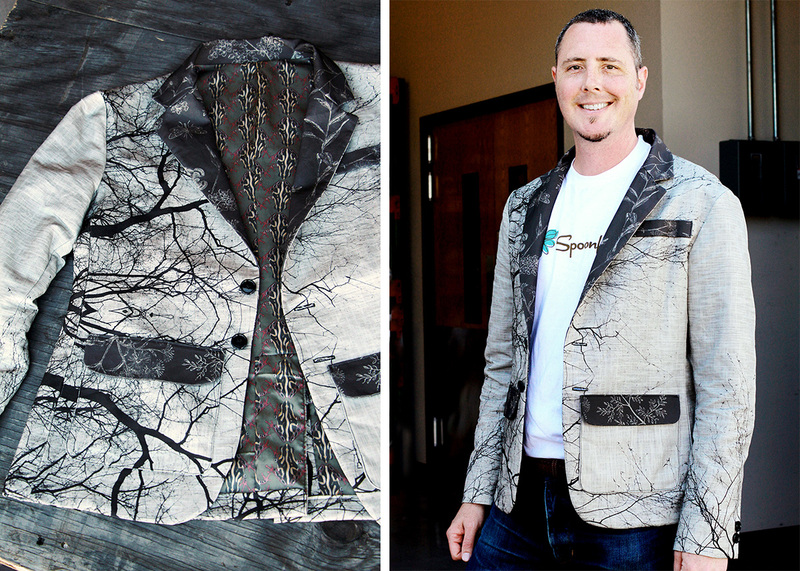 Check out Stephen's rad custom printed blazer he wore this week at FESPA in London! Our friends over at Lumina, a local Raleigh, North Carolina men's apparel company, constructed the jacket with our linen-cotton canvas and cotton silk. 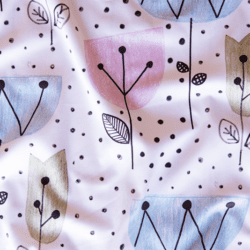 Spoonflower's resident graphic designer, Caroline Okun, designed the engineered pattern for the body of the jacket, the fabric for the pockets and lapel are by Natasha K., and Scrummy designed the frog fabric lining. Announcing: The New Bulk Discount! Announcing the Top 10 Designs in This Year’s Staff Challenge! That’s quite a jacket. The next staff craft challenge for you ought to be to get Stephen (and in-house friends) to make his own instead of resorting to external expert tailors. I wasn’t even aware that there was a London event. You could advertise these things in a slightly more timely manner… Then again, I don’t see Spoonflower in the exhibitors list. So perhaps it was less pre-planned on your part than some things. But does this mean Spoonflower may be opening up operations in the UK? Thanks, we’re really impressed with the jacket too! FESPA is a wide-format printing industry event, but if we make it to the UK for a public event in the future, we’ll be sure to share! oh what a handsome chappie 🙂 The jacket looks amazing! Thanks so much for including my little frogs 😀 Incredible tailoring too. Awesome! I love it! I want NEED one! « Midsummer Night’s Dream Design Challenge Winner!